Remembering Gandhi at his Statue on his Birth Anniversary! ATLANTA, GA: The Gandhi Foundation of USA (GFUSA) and the Consulate General of India (CGI)-Atlanta jointly hosted a magnificent community celebration for the Mahatma’s 148th birth anniversary, which is also ‘The United Nations International Day of Nonviolence.’ Special observation was also made for the 90th birthday of Dr. Christine King Farris, the big sister to Dr. King. The event was at the pilgrimage site of the historic Gandhi Statue located on the grounds of the Martin Luther King Jr. National Historic site, which adorns the KING Center. The day was clear, sunny, beautiful, memorable and historic. Antony Thaliath, GFUSA-Executive Director, opened the ceremony by welcoming everyone. 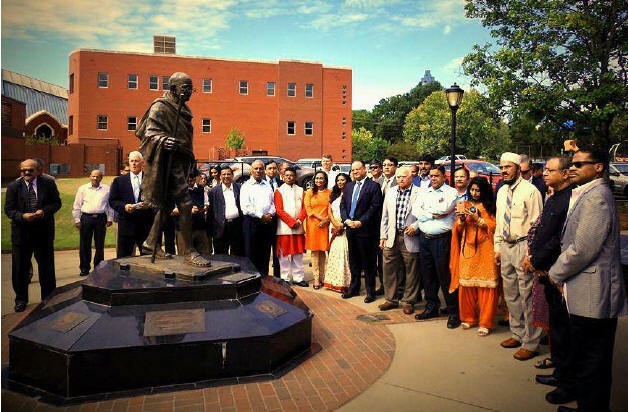 The Gandhi statue in Atlanta is proving to be a big magnet as more than a million visitors come to the King Historic site annually to marvel and pay homage to the invaluable bond between MLK Jr. and the Mahatma. 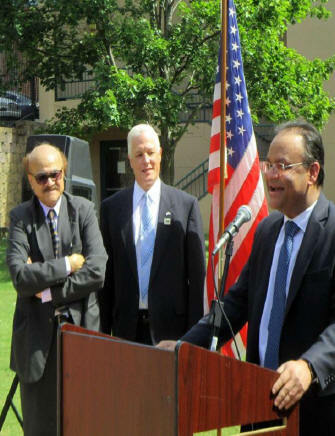 Subash Razdan, GFUSA-Chairman then recognized and thanked all dignitaries, community leaders and supporters for gathering in reverence for the Mahatma. He gave a brief background of GFUSA's service goals and its partnerships with Embassy of India, the Consulate General of India-Atlanta, the King Center, the US National Park Service and numerous communities and their respective organizations. Razdan also led a solemn moment of silence for the victims & survivors of the USA's worst mass-shooting and senseless violence which happened in Las Vegas on the evening before, plus in support of all those displaced by recent Category-5 Hurricanes; Harvey, Irma & Maria (respectively delivering great damage to Metro-Houston, Florida & Georgia, West Indies, Cuba, Puerto Rico and other impacted islands). Mr. Razdan then called Rev Younis Farhat of the First Asian Indian Baptist Church Of Metro Atlanta (FAIBC) to lead the invocation. Following that, the talented Lakshmi Rao & Neera Bahl sang two beautiful prayer songs, leading the chorus with Raghupati Raghav Raja Ram followed by Vaishnava Jana To. 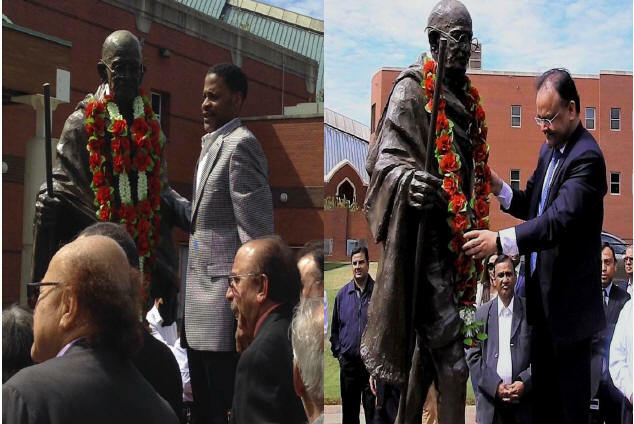 Then the traditional floral homage of garlands and bouquets to the Gandhiji Statue were offered by the dignitaries/VIPs. Garlanding by Isaac Newton Farris and Consul General Nagesh Singh. Subash Razdan and John Naugle listen. 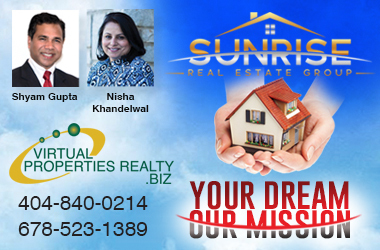 Earlier former Ambassador Nirupama Rao and recently current Ambassador HE Navtej Sarna had also expounded the idea of a possible Gandhi Center in Atlanta. Greg Pridgeon, Vice Chair GFUSA-and former Chief of Staff to Atlanta Mayor Shirley Franklin, reiterated that Dr. King's philosophy was significantly influenced by the great Mahatma, and both have helped in bringing different races together worldwide. They are revered today for their legacies, causes and convictions. ever in flesh and blood walked upon this Earth." better celebrate the great legacies of Gandhiji and Dr. King." Prayer homage at the Statue. Many GFUSA supporters including media and community organizations, especially Sewa International and Indian Friends of Atlanta (IFA) were mentioned in admiration for their community and relief service during the recent Hurricane disaster. The Gandhi Jayanti Celebration finished with several beautiful Birthday Cakes for Gandhi and other dignitaries also observing Birth Anniversaries; Dr. Christine King Farris and community members Sunil Savili of Indian Friends of Atlanta, and Rita Lodh Roy Dannenberg. Delicious refreshments were graciously catered; courtesy Manoj Bhatia. At the close, some attendees “Walked in Peace” (a tradition of GFUSA) to the King (Dr. M.L. King Jr and Mrs. Coretta Scott King) crypts, where bouquets were placed as homage to Dr. King and his wife Coretta Scott King, champions of Civil & Voting Rights. After that some of the attendees also took the optional tour of the Gandhi Room (Museum) on the second floor of the Freedom Hall, KING Center. A memorable day indeed reminding humanity that both Gandhi and King continue to remain relevant!